We’ve all heard it said that the best things in life are free. That’s true really. 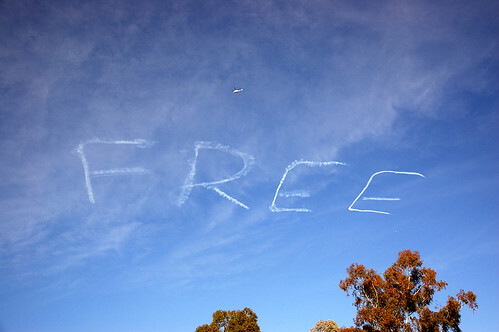 The air I take in, is free. The children that God gave me, were free. My wife who loves me so well, was free. Why is it surprising then that some of the best business that we can participate in has no cost associated to it? Somewhere in the next few minutes it was decided that they would send me one of Paul’s photographs as a sign of their appreciation. They sent it, it’s beautiful. It’s on my desktop now and I think of them often. I make a living charging businesses to help them improve their web presence but one day last week I opened my doors without charging admission. My day of “free” brought me two new friends, a beautiful photograph and the assurance that I can help people, that my advice is usually good. My “free” day cost nothing but I gained a lot. Try free every once in awhile. You may find out for yourself that the best things come out of hiding when you take the pricetags away. OK realist, I know that we can’t live off of free but that’s not my point. Last Friday I offered a group of 63 people a chance to sign up for 30 minutes with me to ask any questions they wanted. Seven took me up on the offer. No catch, not PayPal transfers, just free advice. Somewhere in the next few minutes it was decided that they would send me one of Paul’s photographs as a sign of their appreciation. They sent it, it’s beautiful. It’s on my desktop now and I think of them often. I make a living charging businesses to help them improve their web presence but one day last week I opened my doors without charging admission. My day of “free” brought me two new friends, a beautiful photograph and the assurance that I can help people, that my advice is usually good. My “free” day cost nothing but I gained a lot. Try free every once in awhile. You may find out for yourself that the best things come out of hiding when you take the pricetags away.